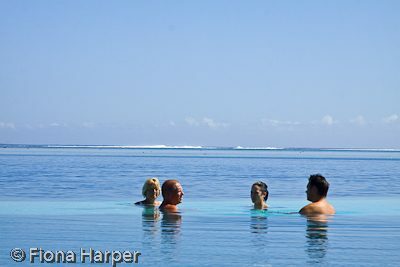 Located ten minutes from downtown Papeete even less from Tahiti International Airport, Manava Suite Resort Tahiti is home to the country’s biggest infinity pool. Though on the first day I arrived, that fact became irrelevant as it rained nonstop as only the tropics know how. Gloomy and overcast, I could barely see the pool through the torrential downpour. Fortunately the sun did finally shine, providing the perfect opportunity to slip into a bikini and test the view from the swimming pool. It would be remiss of me if I didn’t, right? I barely resist the temptation of the swim-up bar, as I’ve a mountain of emails to wade through before departing on the dawn Air Tahiti Nui flight to Auckland. Complimentary in-room internet is a treat not to be taken full advantage of in a country where web access is notoriously expensive. The Manava Suites, decorated in Polynesian style by Tahitian designer Bruno Hervochon, opened to loud applause in 2009. An all suite property with spacious rooms, most with mini kitchens, spacious bathrooms with walk through shower plus a bath big enough for two. A separate toilet makes up the rest of the ablution amenities. A large comfy queen bed with well positioned reading lights are a highlight – why don’t more hotels provide decent reading lamps? Hmm? So too the large patio or balcony with enough space for a decent sized table and chairs. Looking west over the pool and the South Pacific Ocean beyond, dramatically peaked Moorea rises above the horizon, cast in a violet hue as the sun sinks low. Rather annoyingly, within two hours of checking in, I’ve had two knocks on my door, first by housekeeping wanting to clean my room, (go figure!) then by another wanting to check the mini-bar. Manava Suites has one restaurant, Vaitohi, and two bars, Punavai Lounge Bar and the Taapuna Pool Bar. Room service is available, though with a fully functioning kitchen, and a mini-mart down the road, self catering is also an option. Mini-bar raiders beware: any items taken from mini-bar fridge are automatically recorded on guest accounts. This sort of hotel automation freaks me out a bit. What about you? Particularly given the interruption earlier under the pretext of ‘checking the mini-bar’. If the system automatically charges my account, then surely they know that I haven’t touched the mini-bar in the two hours since I checked in. Manava Spa specialises in traditional Polynesian massage, naturally, lashings of fragrant monoi (coconut) oil are an integral part of this relaxing massage. A 24 hour fitness centre should keep most gym junkies’ adrenalin pumping. Having given my legs vigorous workouts on almost vertical mountain hiking of the Marquesas during a freighter cruise onboard Aranui 3, I decide to give my body a rest and skip the gym. There is after all the alluring temptation of Tahiti’s largest infinity swimming pool a mere ten steps from my ground floor patio. Though, I think I already mentioned the infinity pool. I think I also mentioned it would be remiss of me not to report back on this resort without trying out this glorious swimming pool. It is research. Right?